As part of the Secret Gardens of Lake Forest Park Garden Tour, the lower level of the Lake Forest Park Town Center will be filled with local flowers, trees, and art. One of the vendors will be Jordan Nursery. Kevin and Jeanell Jones have an amazing nursery dedicated to raising, preserving and selling fuchsias and pelargoniums (geraniums). 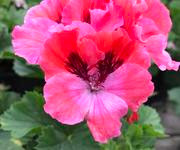 Over the years Jordan Nursery has acquired one of the largest fuchsia and geranium collections in the U.S. Just last year the Nursery cultivated 40 new varieties of geraniums previously not in circulation. They are in contact with people across the world to find and share old fashioned, non-patented varieties. 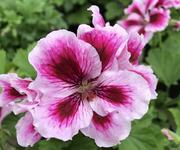 Geraniums/ pelargoniums are a perfect plant for newcomers and experienced gardeners alike. The plants are easy to care for, they last all summer (and can be wintered over), they are scented and they repel flies. They can be in gardens; they take part shade and they can be in containers. The flowers come in lots of different colors in the pink, red, orange and white families. The leaves themselves are interesting with varied leaf and color structure. Martha Washington’s, known in the British Commonwealth countries as Regals, will be in full display at the Garden Market. Nestled nest to the geraniums will be fuchsias. These hardy and varied plants come in single blossoms and double, some of them trail out of baskets others stand upright. The colors range from white to pink, red to purple. The leaves can be variegated or regular. Take a look around the city to feast on the varieties of fuchsias. These delightful blossoms attract hummingbirds and other pollinators. This year the Jordan Nursery made 30,000 cuttings of these amazing plants. A wide variety of these plants will be available at the Garden Market at the Town center on June 16. Garden Tour tickets are available at the Secret Gardens website, and at the Lake Forest Park Farmers Market, Wildbirds Unlimited, Sky Nursery and Town Center Hardware. DKH - you seemed to be learning the names of flowers when you had all the iris pictures! I was impressed - but the photo at the top of this is a geranium, not a fuschia. Happy summer!